Well, after talking - for at least 5 years - about covering our koi pond and with the projected increased cost of natural gas, Susan & I did some serious research. 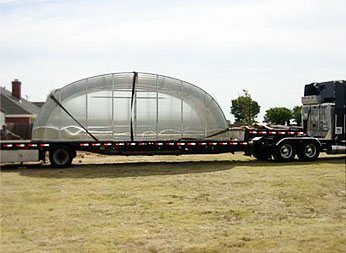 We considered lots of different options from commercial greenhouse type covers using heavy duty plastic sheeting up to a full-size greenhouse. After considering both aesthetics and our check book balance, we decided upon a custom sized cover primarily used as a swimming pool cover. 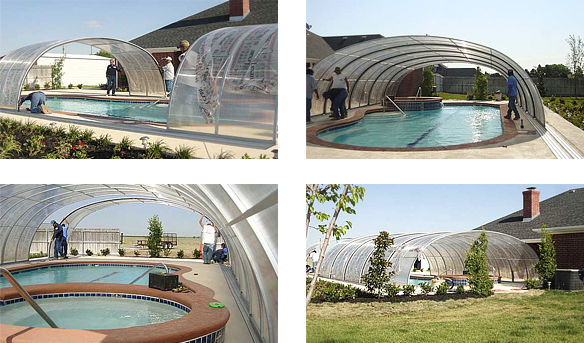 The Aqua Shield is made with an aluminum frame covered by lexan. Covers come is various shapes - ours is the "sport" model. 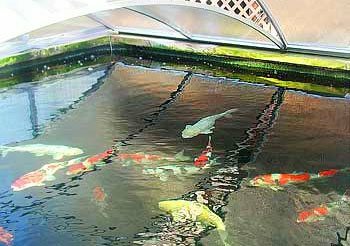 It can easily be opened to view and feed the koi. 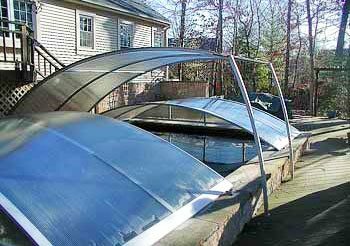 In just the two weeks that the cover has been installed,our pond temperature has risen 5 degrees without the aid of the heater! The Aqua Shield cover exceeds our expectations! If you are interested in a quote,contact Spiro at 800-613-3339. "The cover arrived in great condition and was easy to set up, just like you said it would be. The sun finally came out on the weekend Saturday. It was 38 outside with snow on the ground, 80 in the enclosure. It felt just like summer. We swim almost every day. We wanted it sooner but it was worth the wait. There are still a few details we want to take care of but those can wait for nicer weather when we can open it up. Thanks again." 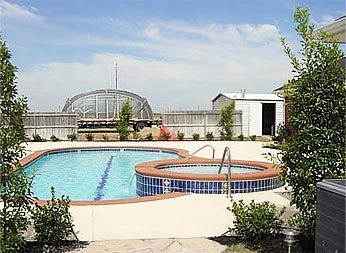 Above ground pool turned into a year round entertainment center for the whole family. As you can see from the photos anything can be done if you give it some thought. 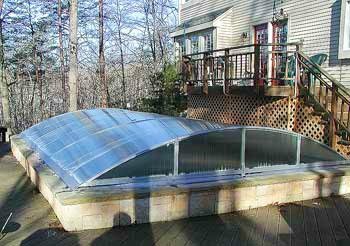 One of our clients, Mark Chapman located in MI built a deck around above ground pool and decided to attach to his home. He decided to put Elipse with a double doors on the side of the house so he and the family could enter the pool during the winter months without having to go outside. As with all of our products the enclosure arrived fully assembled and ready to install. The workmen simply carried the sections one by one and placed them on the designated track. The entire project took less than one day to complete. "Since the enclosure has been installed it has withstood 70+ MPH wind, and numerous snow storms some totaling up to 16 inches. We are really enjoying our pool year round". 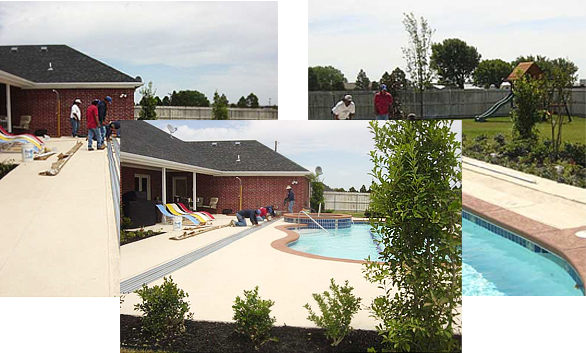 See the entire pool transformation. The enclosure arrives on the flatbed truck. 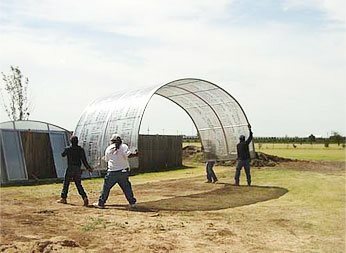 This particular unit is an Ellipse Shield Model 24 x 9 x 40 '2". As you can see, the entire enclosure is shipped fully assembled and fits one section into the other. So the total width for shipping purposes is not more than 7ft wide. It will sit on your pavement just as it does on the truck. Takes less than 40 minutes and can be done with a crew of 4 men. It is not necessary to use special machinery or a crane to unload as the average enclosure section weight approximately 60 - 120 lbs depending on size. Placement and installation of the tracking system. Each set of tracks has been pre cut and pre drilled to your specifications and can be used as a template in order to allow for a quick and thorough installation. Once the tracks are attached to the cement pad it is time to install the shield sections. Each section slides and attaches to it's corresponding track. Once the curved sections are complete it is time for the end panels. The End panels are also fully assembled and can be attached or removed in a few minutes using the quick release pins provided. Installation takes less than one day!